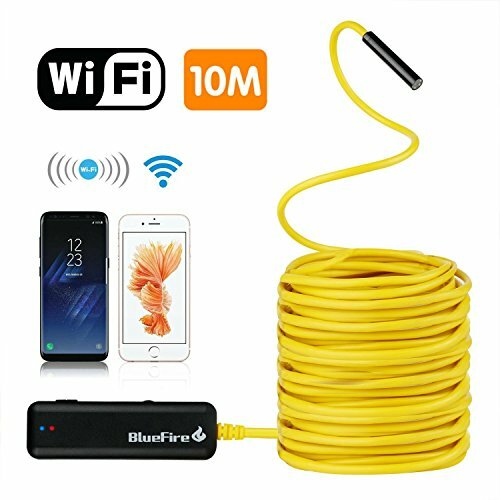 BlueFire semi-rigid flexible WIFI borescope uses the latest advanced WIFI technology. Support 2 - 4 cell phones or iPad /tablet at the same time. It is an ideal tool for home inspection, HVAC inspection, auto and industrial repair. You can record video and take clear pictures with ease. 【WIDELY COMPATIABLE】 This is the latest wireless endoscope design at the moment, unlike other traditional endoscopes on the market, this wifi endoscope camera can support both Android smartphone(Above Android 4.4) and iPhone IOS system(Above IOS 8.0). 【SEMI-RIGID CABLE】 The semi-rigid cable is great for allowing more control of the direction of the inspection camera, especially as this tool in intended to get into small spaces that would otherwise be near impossible to see. 【WIRELESS】 This wifi borescope has its own Wi-Fi Signal and a build-in Li-lon rechargeable battery, there is no external cable or adapter needed, all you need to do is just to download and install the "WIFI VIEW" app on your smartphone and connect to its WIFI. 【EASY TO USE】 Scan the QR code in the manual to download APP WIFI VIEW, Connect your smart device via WIFI, Open the APP and the live video will show up on the screen. PLEASE DON'T RESET THE WIFI PASSWORD BY YOURSELF, OTHERWISE THE ENDOSCOPE WILL BE USELESS.